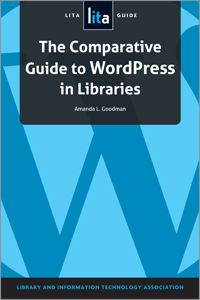 "The Comparative Guide to WordPress in Libraries: A LITA Guide"
"Learning from Libraries that Use WordPress: Content-Management System Best Practices and Case Studies"
"Effective Blogging for Libraries (THE TECH SET® #10)"
effective ways to use images, audio and video. Goodman is the user experience librarian at Darien (Conn.) Library, where her projects have included redesigning the library’s website, creating marketing materials and co-managing adult technology education classes. As an MLIS student, she redesigned the Library and Information Studies’ website at the University of North Carolina at Greensboro using WordPress. It became a model for other UNCG departments’ websites. She blogs about her work at A Ghost of Daisies. The Library and Information Technology Association (LITA), a division of ALA, educates, serves and reaches out to its members, other ALA members and divisions, and the entire library and information community through its publications, programs and other activities designed to promote, develop, and aid in the implementation of library and information technology. ALA Store purchases fund advocacy, awareness and accreditation programs for library professionals worldwide. Contact us at (800) 545-2433 ext. 5418 or editionsmarketing@ala.org. I totally agree with you. Wordpress is a leading open source CMS just due to its advantages as compared to others. In many other CMS, for example, Shop-Script cost virtually any improvements measured by at least a couple of hundred dollars. Add the project to freelance exchange that should be carefully finished to cart Shop-Script. You will see the strength of the 5 applications, of which 3 are frankly odd. The competition is minimal, because the system is complex and requires very specific knowledge. Accordingly, the price of the work will be relevant. That's why wordpress is the best choice. I also run a website on wordpress designed by wordpress cms development agency http://www.worksole.com/wordpress-website-development/ . But this is also the fact that it is not suitable for large corporate sites, for example, in the financial sector, where the need maximum protection against tampering and integration with non-cash accounting systems. Anyways, thanks for sharing the informative stuff with us.